The S-6421 Series guns have outstanding ability for the welding of heavy duty sheet steel applications. They are easy to handle with movement on all three planes of operation. · Rated at 42KVA with 26,000 amps short circuit secondary current. · Interchangeable standard arms provide throat depths of 9.84" through 41.34". · Maximum electrode force of 1,210 lbs. at 72 P.S.I. and shortest throat depth. · Able to weld two pieces of 6 ga. mild steel together with 9.84" throat depth. · Suitable for use with full range of standard and special controls. 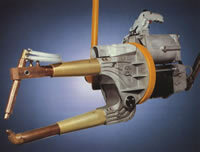 · Trigger controlled retraction for extra electrode clearance with automatic return to working stroke. · Compact ball-race type gyroscopic suspension system for excellent maneuverability in three planes. · Standard cable length 50 ft.